Often times we value that which is monetarily valuable. We seek the best of the best and can overlook the rest. Dale and I were strolling over the hills in the back fields by our house. We had just spent a few hours in the gardens weeding, hoeing and harvesting. It was time to stretch the legs and walk. As we broke through the pine trees and into the field of blackberry bushes, in the distance I saw flecks of gold and creamy white reflecting the evening sun. Wildflowers. Once or twice I have had my grandsons run and either collect a few handfuls of flowers... or stamp out clumps of them, as if they were enemy invaders, and their little legs were the big guns sent down to save the masculinity of the land. Insects would take flight and giggles and feet ran on to the next island of color out there. Yesterday, it was just Dale and I. Our peonies and irises have come and gone. A rose stands tall in a gorgeous Swedish glass vase and now... wildflowers sit on the coffee table center stage. Do you want to highlight any wildflowers that either you pick, or your little ones carry in to you? Trim off as many leaves as you can. None should be in the water, as they cause the water to cloud and stink! 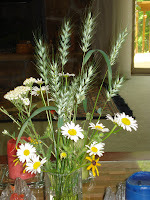 Along with the flowers, pick some tall grass that has gone to seed. This adds a soft light green extra. The vase? Either a mason jar, or an odd drinking glass is the perfect choice. Accent your table with contrasting candles, or napkins. Have fun. Decorate your table just as the fields were decorated with these beauties.